I've just sent the following to our Mayor & City Council regarding their 4-3 split decision (yes) on March 24th regarding their decision to purchase the adjacent land across the creek from Brook Run Park. The land would allow for a future trail that would connect to the Georgetown and the on-going Project Renaissance parks & development. Click HERE for the detailed documents as presented & voted upon by our City Council (Large download -- 45 MB). The three "no"s are of concern. Hindsight being 20/20, I really think that at least two of the "no"s, according to their expressed reasons, should have delayed the vote, asked for more information & then voted yes. Come local elections in 2015 and we get in another "No", then we can just forget about our plans and investing in our future. Might as well start thinking about where you want to relocate. 'cause in 2016, they'll be voting on paving the rest of Mount Vernon -- and -- will have the CHOICE to add in to the budget to install bike lanes the rest of the way (just like it is today along Mt. Vernon west of Ashford-Dunwoody). The list goes on. 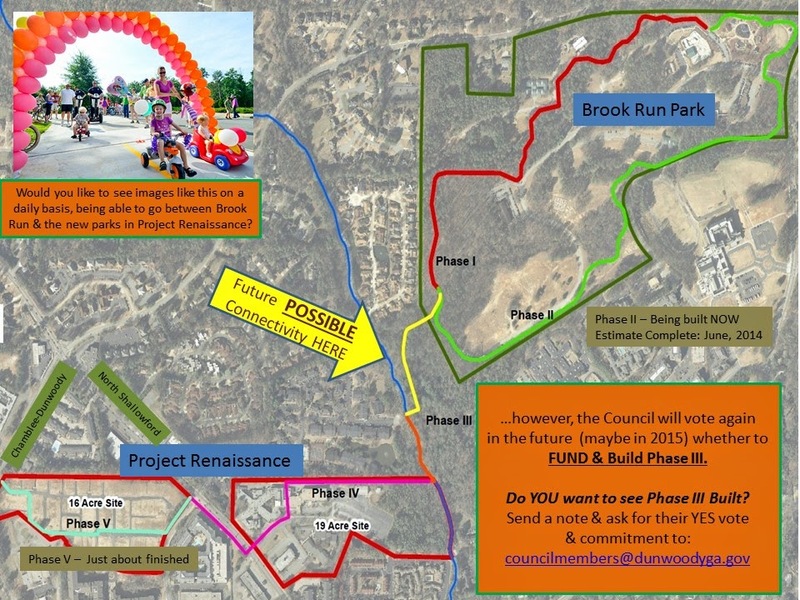 Would you like to see trails continue to be built in Dunwoody? and ask for a reply with their commitment. AND -- please come to the City Council Meetings, sign up for Public Comments & let your voice be heard. It's just a couple of hours and it so important. I have received replies or had discussions (even briefly) with the three of you who voted no on the land purchase to connect across the creek to Brook Run. And I appreciate that. However, it is the FUTURE that still concerns me. And so I am sending this note and will be “rallying the troops” around supporting continued investment in our trails, bike lanes and other amenities in our community through the coming years. And they will be asking for your commitment in voting YES on these projects. The faces of supporters can be widely seen for example on a Thursday night at Brook Run at the Food Trucks. I know three of you voted -- for varying reasons – against spending 0.12% of our city budget ($30k) for the purchase of the land to connect the Brook Run Trail with Georgetown development. Yet when it comes to spending TEN percent of our budget on repaving roads ($2.5M), there’s unanimous consent. Yes, I agree there were “concerns” of spending another $30-60K in committed funds to do landscaping, signage & fencing for the apartment owner. So then the whole transaction would run us about 0.40% of our city budget ($100k). Is our Economic Development Director, Michael Starling relaying this information to the executives at the likes of State Farm when they are considering a major relocation and investing in a 2.2 million square foot mixed-use development in Dunwoody? Are you telling our major corporations that you don’t want to invest in trails and follow our master plans to enhance the quality of our lives and improve property values? All because of an additional 0.3 percent of our annual budget? Are you receiving some kind of insider information that our hired consultants don't know about trails, best practices and wetlands protections? If so, can you please share with us your findings and cite your sources & references? I’m not shy and don’t mind spreading the word to the corporate world this information – regardless of the fact that PCID is self-taxing themselves to BUILD their own internal trail system. You think that State Farm & friends would like to have neighboring non-motorized connectivity over to affordable housing in the Georgetown area? And that the Millennials truly prefer having a CHOICE to ride a bike a few of miles to work instead of sitting in stop & go traffic? Or even retirees when seeking a place to settle? Or someone being told by their doctor they need to get out & exercise? We cannot solely build additional motor vehicle capacity to accommodate the predicted growth in our area. Providing alternatives at a fraction of the cost of building out new roads is something we need to be doing. Just like the PCID is planning. 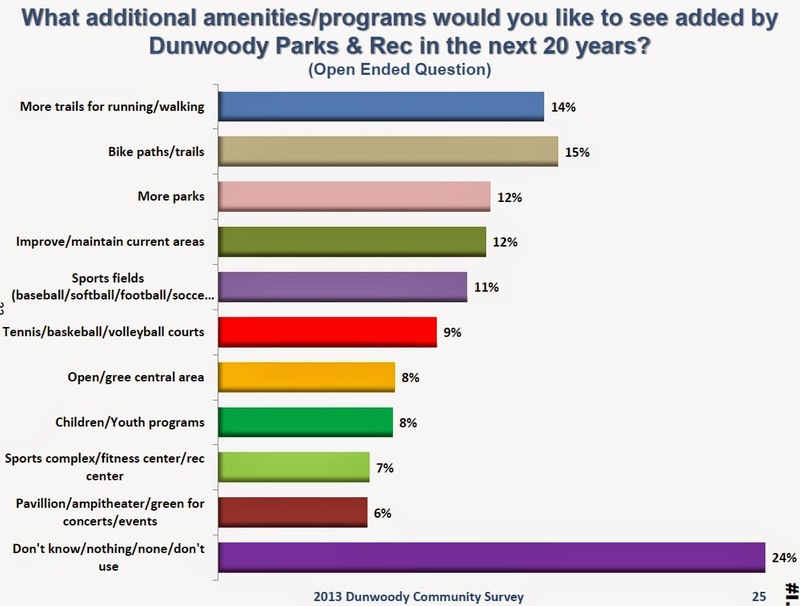 Have you reviewed the 2013 City of Dunwoody Community Survey? Do you know what were the top two responses by our citizens to improve our parks? Trails. In reviewing the council comments from March 24th, clearly two of the three “NOs” were due to needing more information. #1: I recommend that during the initial DISCUSSION item, you bring up questions and ask staff to get you more information that you need to make decisions when it comes up for a vote. #2 (a) : On the day of the vote, instead of voting NO, if you still have questions that you need answered, then MAKE A MOTION to vote on the council tasking staff to get more information. #2 (b): If you believe that the action requires a re-write (purchase contract agreement, etc. 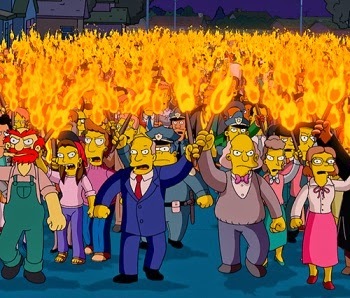 ), then again, then MAKE A MOTION to vote on it. #2 (c): Once staff either brings you more information, or changes the contract (etc. ), your questions will be answered. THEN take a vote. Can I PLEASE get your assurance that you will ask for more information and proposed to delay the vote until you know all that you need to know before making a decision? "Trails are responsible for a 4 to 7 percent increase in property value for homes within one-quarter mile." In setting the budget for 2015, I look forward to allocating resources to build Phase III of the trail, connecting Brook Run with Project Renaissance and for the Council to vote YES to fund its construction. I will be working within the community, building up strong broad-based community support for this action. We will ask for your continued support in fulfilling the vision of our citizens as expressed in our city's master plans. "Overall we find that bicycling infrastructure creates the most jobs for a given level of spending: For each $1 million, the cycling projects in this study create a total of 11.4 jobs within the state where the project is located. Pedestrian-only projects create an average of about 10 jobs per $1 million and multi-use trails create nearly as many, at 9.6 jobs per $1 million. Infrastructure that combines road construction with pedestrian and bicycle facilities creates slightly fewer jobs for the same amount of spending, and road-only projects create the least, with a total of 7.8 jobs per $1 million."